I fell in love with Seattle at first sight when I moved here almost 15 years ago to pursue my doctoral work at the University of Washington. Much of Seattle’s urban landscape reminds me of home town of Dalian. Its hilly streets, stunning natural beauty, strong Asian influences and heritage, and vibrant urban culture enthralls any new visitor and beckons them to stay. That was certainly the case for me. The “Emerald City” abounds in natural beauty, from snow-capped peaks and lush forests to coastal waters and glacially carved lakes. Seattleites embrace the great outdoors to the fullest—we hike, bike, ski, climb, camp, fish, paddle, you name it. Within this stunning landscape is a global hub for innovation, leading research, and entrepreneurship, including the likes of Amazon, Microsoft, Starbucks, Boeing, the University of Washington, Costco, Nordstrom, Expedia and Bill & Melinda Gates Foundation, to name just a few. Anchored by these tech, industry, and research leaders has emerged a dynamic start-up culture. These are among the many reasons you'll feel right at home here. 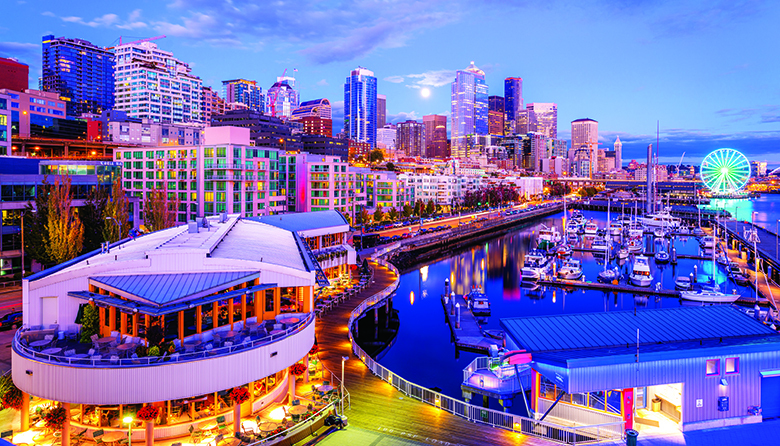 Seattle is hip, vibrant, and home to thriving art, music and culinary scene. We’re among the most well-read and educated population in the country. We are home to the world-renowned Seattle Symphony, the Seattle Opera, and the Pacific Northwest Ballet, but also the birthplace of Nirvana and Jimi Hendrix, and a heritage of spurring independent music. Seattle is the foodies’ paradise. Our talented local chefs use hard-to-beat fresh ingredients from local farms and waters to create delicious dishes that will satisfy every taste bud. Seattle (and Washington state) have a long history of economic and cultural ties with China. The Chinese pioneers first arrived in the region in the late 1850s, and the first Boeing engineer was Chinese. In 1979, the Port of Seattle was first port of call in 30 years for a Chinese vessel. Since then every Chinese president has made Seattle a major stop in on their U.S. visits. Today China is Washington’s largest export market, and increasingly a source of foreign direct investment. Now let’s turn to the pages that follow to read in-depth stories about the richness of our region and gain a better understanding of what really makes Seattle a great place to live. You’ll discover different ways of enjoying our natural beauty, such as a multi-day road trip or strolling along beautiful beaches and parks. You’ll explore our charming neighborhoods to learn about the places we live in and discover favorite local spots. You’ll find where to dine for some of the best local, fresh ingredients, or have a pint of one of our best local brews, and where to shop for the latest fashions and one-of-a-kind local artisan gifts. You’ll receive an insider’s look at our booming real estate market, a top market for Chinese home buyers, with a focus on the luxury homes. You’ll learn about innovative collaborations between China and Seattle, as well as how our local art groups find creative ways to bring arts and audiences together. This is the third year of Seattle Luxury Living by Seattle Magazine, who has served as the “owner manual” for exploring and understanding this vibrant city with in-depth stories and recommendations on hot spots for over 50 years. We hope you enjoy the magazine, and Seattle—a place that you may call home someday. For digital edition of Seattle Luxury Living or sharing helpful content about the thriving city of Seattle with friends, families, and business associates, please scan our WeChat QR code or visit the digital edition here. Plus, other high-end retail locations. You can also download and view the digital edition here.